* Voice Assistants: Amazon Alexa Built-In (certified), Siri (works with), Google Assistant (works with) and Baidu (works with). This product is Dust resistant and can resist a sustained, low-pressure water jet spray. This product is Dust resistant and can resist high-pressure, heavy sprays of water. The product is Fully dust tight and can resist high-pressure, heavy sprays of water. For easy and comfortable position around the neck. 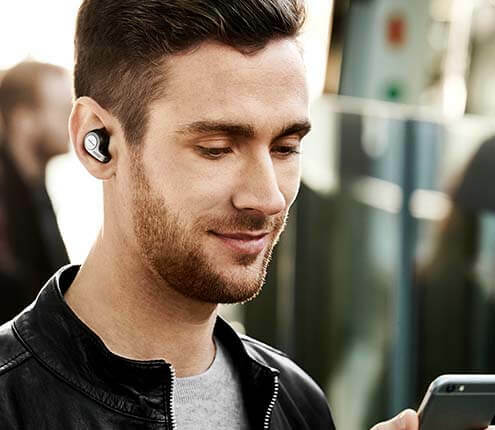 When the earbuds are connected, your music will pause or your call will be ended. 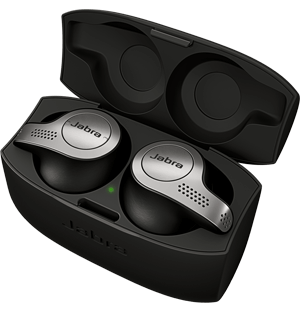 Jabra Elite 45e - Micro USB cable - 3 sets of EarGels and Earwings - Quick Start Guide - Warranty- and Warning Leaflets. Use the drop-down menus to compare the Elite models.